Author Charles Adler makes the physics behind science fiction accessible and interesting. Charles Adler became a scientist because of his love of science fiction and Wizards, Aliens, and Starships was written for his 15-year-old self as well as for anyone who would like to know which parts of science fiction are based on science, and which parts are not—and why not. Charles Adler is voracious reader of science fiction, takes it seriously, and says that many science fiction writers do try to get the science right, or at least try to get the science believable. There are four sections to Wizards, Aliens, and Starships: Harry Potter Physics, Space Travel, Worlds and Aliens, and The Survival of Humanity in the Distant Future. The author starts off by identifying the one significant difference between fantasy and science fiction. Authors of fantasy create rules by which magic works, though magic’s use may not follow laws of science, nor be consistent. He strongly declares his annoyance at authors who make things up without concern for cause and effect, being especially annoyed with J. K. Rowling in this regard for things happen in Harry Potter for no reason at all! The author uses the Harry Potter series as the fantasy writer’s “poster child,” pointing out that Harry Potter does not follow the laws of conservation of mass, energy, momentum, or even the hallowed second law of thermodynamics. For example, the reparo spell puts broken things back into order—disregarding the fact that an arbitrary order of something complex in the past may be incalculable in the future. And as for a blatant disregard for the conservation of mass, the reader should consider Draco’s metamorphosis into a ferret. Go ahead, just consider it. When Draco is turned into a 20-kilogram ferret, where did the remaining 40 kilograms of him go? Well? You don’t have an answer, do you? Didn’t think so. Being unscientific is not limited to fantasy; Adler offers examples where science fiction also breaks the laws of physics, as for example with Star Trek’s transporter. Teleportation simply violates too many laws of physics. You can’t convert mass to energy and back to mass without killing the object transported. Just a small thing, but unscientific nonetheless. In the chapter titled “Fantastic beasts and how to disprove them” Adler identifies a number of fantasy animals and explores their possibility of having a real existence, for example by “scaling up” humans to create giants. Real animals are supported by their structure and the relationship between an animal’s volume and mass follows an inverse square law, that is, an animals weight increases more rapidly than its surface area as it grows. It must be pointed out that tigers do look a lot like scaled up house cats but perhaps that would not be in the spirit of this endeavor. The sections on space travel lean heavily on physics and economics. The author provides a “back-of-the-envelope” calculation to determine the cost of fuel needed to get an object into space. An object needs to be moving at a speed of 17,000 mph to get into orbit, and to achieve that speed, the mass of fuel would end up being greater than the mass of the object. Using the space shuttle as the example, he tells us that the mass of the shuttle’s fuel was 20 times greater than the mass of its payload. As the rockets and fuel tanks together weighed 2,000,000 kgs and contained $2 million of fuel, the fuel cost per traveler was approximately $300,000. And there’s one more depressing thing (to those who dream of discount space travel), each shuttle mission cost $450 million or 200 times the cost of the fuel. The tremendous difference was due to the cost of infrastructure. How about space stations that hold more than a few people? The author cites and defers to physicist Gerard K. O’Neill, who proposed building a 10,000-person space station back in the 1970s. Adler also considers issues of ecology in self-supporting space environments, noting that growing food for large numbers of people would be problematic but given enough plants there should be ample oxygen. Still, the problem remains that the cost of fuel to get into space will be minor compared to the cost of infrastructure, that is, of maintaining a space station. Low-cost alternatives to rockets might arrive through constructing an elevator into space. (Press the “up” button and wait how long?) However we do not as yet have any physical material strong enough to make a tower tall enough that wouldn’t promptly tear itself apart from the stress. The tension forces at 140,000 km above the surface of the Earth are 10,000 times more than the breaking strength of steel! And though carbon nanotubes are 1000 times stronger than steel, 1000 times stronger is still not strong enough. Manned interplanetary travel has its difficulties, too. First is the question of the utility in sending humans into space when robots achieve better results at less expense. Another is, where would humans go and what would they do? The author isn’t cheerful on this point, “Unfortunately it seems there is no other intelligent life in the solar system apart from humans, and no habitable planet apart from Earth.” Even so, consider humans innate desire to journey to the stars – because its there. The nearest star, Alpha Centauri is just a short 4.3 light years away, though nothing can travel faster than the speed of light, but still . . . It’s possible to achieve near lightspeed. The author notes the limitations of chemical energy to achieve the near light speed needed to travel to the stars, and then considers advanced forms of propulsion to reach those speeds. Nuclear power at this point seems more promising than antimatter. One method of nuclear-based propulsion is to use a nuclear reactor to heat hydrogen gas, and use that gas directly as an exhaust fuel. Propulsion by this method would allow a spaceship to attain a maximum speed of 8500 meters per second, though this is only twice the energy released through chemical fuels. More energy could be liberated by using the energy of splitting atoms directly but it isn’t immediately obvious how to achieve it; the biggest issue is one of material science—you wouldn’t want to melt the reactor nor would you want to blow it up. An alternative think-big idea that was considered in real-life (and funded, at least for studies, at least for a while) was project Orion. The plan for project Orion was to build spacecraft with a large highly shielded plate at the back and to explode nuclear bombs behind to push it forward. The physics problem shifted from material science to human endurance; the high acceleration produced by exploding an atom bomb so near would crush the passengers and irradiate everything on the wrong side of the plate. An interested reader can find out more about project Orion in The Curve of Binding Energy, by John McPhee. Though nothing can travel faster than the speed of light, interesting Einsteinian time-space-relativistic strange things will happen when travelling near the speed of light, especially if your twin stays at home. And there is one itsy bitsy caveat that makes one hopeful - the speed limit only holds true only to the best knowledge of physics today. The author’s discussion of faster than light travel (FTL) and its paradoxes are so interesting that justice cannot be done in a review, you just have to read it for yourself. In “Worlds and Aliens” the author compares the climate of Earth to lifeless Venus and Mars, and states, “Each lifeless planet is different from each other in its own way; all planets with Earth-like life on them will be fundamentally the same.” He assumes life found on other planets would be carbon based; that the planets with life will have an oxygen atmosphere and a temperature averaging between the freezing and boiling point of water. Adler addresses the physics of stars, and the need for life-friendly planets to orbit in the “Goldilocks” zone (where a planet is neither too hot nor too cold). He also notes the problems in using the Drake’s equation to calculate the likelihood of life on distant planets – there are just too many unknowns. In the section “Survival of Humanity”, the author provides end-of-the-world scenarios where the Earth is destroyed by nuclear war or global warming, and humans move on, colonizing outer space by terraforming planets—planets in our solar system or planets orbiting other stars, or by world-building, constructing Earth-sized space stations. If we were to terraform a planet within the solar system, Mars would be a better place to start than Venus due to Venus’ high surface temperature and pressure, and photosynthesis might be used to free oxygen from iron in Mars’ soil, though the process of turning Mars into a habitable planet could take anywhere between 300 and 3000 years. He asks the reader, “How would Mars turn a profit?” having forgotten that he destroyed Earth a few pages before! Profit taking should be the last of his worries. For world building without the hindrance of starting with an existing planet, there are Dynaspheres or Ringworlds (large shells or networks of space stations built around a star), though the author’s consideration of world building begs the question of how to build large structures in space, the source of construction material and so on. If you already had a planet to work with then why go through the effort of constructing an artificial one? There is (again) the not insignificant cost of generating enough energy to build something that large from scratch, and afterwards in maintaining the orbit of such a large and segmented structure. Though these certainly are interesting things to think about. And despite all of the nagging questions, despite destroying my dreams of traveling to the stars and participating in U.N.-type sit-down discussions on the relative merits of Star Trek versus Star Wars with multi-tentacled benevolent aliens, one just has to admit all of this (science and science fiction) is pretty cool stuff. Though the author’s claimed intention for Wizards, Aliens, and Starships is that it be used as a textbook, it doesn’t really read that way. There are no exercises, only a note indicating that homework problems can be found on the publisher’s website, however, if a teacher were to consider this book for use in a classroom, its themes include physics, the forms of energy, and the economics of space travel and habitation. The author is unafraid of using formulae, and Newton’s laws are in an appendix. Also, as Wizards, Aliens, and Starships happens to be very well referenced in both science fact and science fiction, a writing instructor might consider its use in the art of writing more believable science fiction. 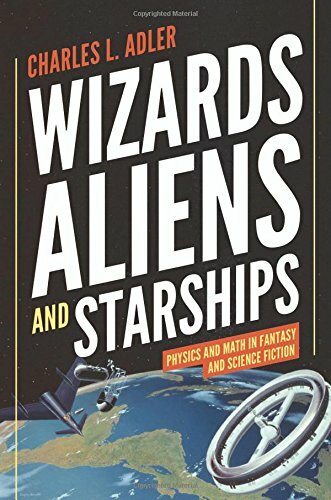 Wizards, Aliens, and Starships is a great book by itself or as a starting point for exploring the physics of space exploration as well as the classics in science fiction.